I have honestly tried to stick to a facial regimen for as long as I can remember but have failed every time. But this I have been on for a month now. It may be because different brands come my way and I would honestly want to give my honest review on them. But there’s this strong feeling it has a lot to do with my withstanding issue with multi-step things. Is it just me, or regimen sounds a little rigid too? Or I might just be one plain lazy cow when it comes to facial this and that. Pond’s Gold Radiance Youthful Glow Day Cream with SPF15 claims to work deep within the skin to re-energize the lost radiance of aging skin cells. Infused with 99% real gold micro particles. It claims to improve dullness & protect your skin against UV rays. The first thing that attracted me to this cream is its SPF. Look, Ma! No need for extra everyday sunblock. Celeteque Eye Plus Dark Circles Lightener is the one from this bunch I have used the longest. It was after all the hassles of our home project last May that I saw the nightmare that are my eyebags. As I have mentioned in my Celeteque review and giveaway post (don’t forget to join! ), it is the one eye cream that I have seen to really lighten my otherwise panda eyes. I got introduced to Ysabel’s Daughter Revitalizing Facial Serum via the Saladbox. It retails for P950 for this 30ml. I have been hearing a handful of raves about it. But not to take their word for it, I got down to trying it myself. The All Natural in its branding was what got me listening. Ysabel’s Daughter Revitalizing Facial Serum’s ingrediets: Water, Honey, Laminaria Sacchirina Extract, Coenzyme Q10, Jojoba Oil, Cetyl Alcohol, Stearic Acid, Algae Extract /Pullulan, Dipalmitoyl Hydroxyproline, Glyceryl Caprylate, Triethanolamine, Sodium Phytate/ Aqua Scent. Wow!!! You def have great products here. No wonder why these products are in your routine. 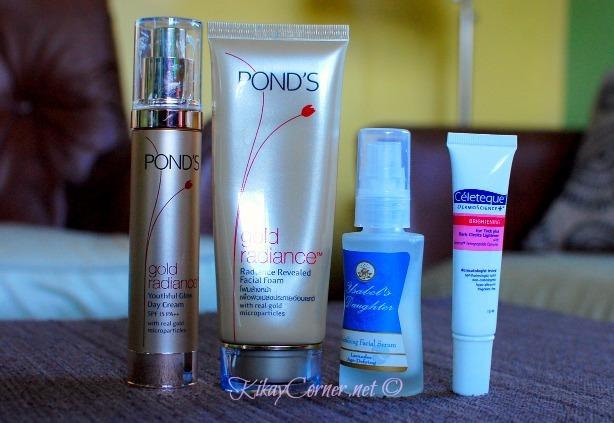 I have tried the Pond’s Gold Radiance Youthful Glow Day Cream with SPF15 and i so love it. It def protects my skin and produces a healthier glow.